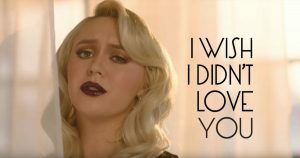 “Wish I Didn’t Love You” is the original song by The Voice season 13 winner Chloe Kohanski from Team Blake Shelton. She landed in second place on the sales chart with the original tune “Wish I Didn’t Love You.” This emotional ballad was well-suited to her edgy style. Her cover of Kim Carnes‘ 1981 chart-topper “Bette Davis Eyes” sat in seventh place on the iTunes chart. That this 23-year-old talent chose to cover a song from 14 years before she was born is not so surprising given the success she had on the second live show with “Total Eclipse of the Heart.” Her rendition of that 1983 power ballad by Bonnie Tyler was your favorite among all of Kohanski’s performances on season 13 of “The Voice.” Listen and download Wish I Didn’t Love You ringtone for your android or ios.